During the summer of 2015, Dovetail conducted exploratory excavations on the grounds of Tudor Place, a historic Federal-style mansion in the Georgetown neighborhood of Washington, D.C. The excavations focused on the yard of the building now housing Tudor Place’s administrative offices. This building, known as the Dower House, was a dwelling constructed sometime around 1867, roughly 50 years after the completion of the Tudor Place mansion. The house was built on what was once a portion of the grounds of Tudor Place itself, prior to the subdivision of the property into smaller parcels. As such, Dovetail’s excavations revealed artifacts related to the occupation of the Dower House, as well as earlier artifacts relating to the main Tudor Place mansion and other associated buildings and activities. Among the artifacts recovered was a sherd of blue and gray salt-glazed stoneware (pictured above). This type of ceramic was commonly used in the nineteenth century and is frequently recovered on archaeological sites. Vessels made of this ware included crocks, storage jars, and other utilitarian forms. These vessels were usually produced locally, as they were relatively easy to make and fire and few people wanted to pay the added cost involved in importing such commonplace, practical vessels from far away. Tablewares like plates, bowls, and teacups, on the other hand, were meant to impress, and would be imported from overseas manufacturers who were set up to produce more beautiful and delicate ceramics. 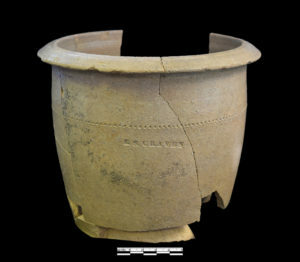 Despite how common salt-glazed stoneware is on archaeological sites, Dovetail archaeologists got an unusual bonus with this particular fragment: it was embossed with the name of the manufacturer. The sherd was clearly stamped with the name “HUGH SMITH & CO.” A bit of research revealed that stonewares were being manufactured under the Hugh Smith name in nearby Alexandria, Virginia in the nineteenth century, showing that the residents of the Tudor Place property were indeed obtaining locally produced stonewares. As thrilling as it was to discover this level of detail in the archaeological record at the site, it gets even better—we could narrow the manufacturing date range of our sherd down to only a few years. As it turns out, pottery bearing the Hugh Smith name started being made around 1821, but only used the “HUGH SMITH & CO.” mark until 1825, when it was exchanged for the slightly abbreviated “H. SMITH & CO.” Not only did we find out where this fragment was manufactured, but we narrowed the production date down to a period of only five years! Although it is difficult to say when the vessel was broken and discarded, this nonetheless provides us with valuable information about the consumer habits of members of the Tudor Place household during a very brief window of time and allows us to make inferences about more general patterns of consumer behavior during that period. It started with a frantic phone call from an employee with the City of Fredericksburg: a construction crew downtown had uncovered a mass of stoneware fragments. The Marshall-Bell site, named after the known potters of this 1830s kiln, not only produced an abundance of artifacts and information on early-nineteenth century urban kilns, but its emergency excavation rallied a group effort of immeasurable proportions. This pro-bono salvage effort conducted by Dovetail Cultural Resource Group and their non-profit partner, the Historic Fredericksburg Foundation Inc. (HFFI), brought together city residents, cultural resource management firms, City employees, state historic preservation office representatives, developers, and non-profits like George Washington’s Ferry Farm, George Washington’s Mount Vernon, and the Fredericksburg Area Museum and Cultural Center, to complete the field work and laboratory analysis. Work on the site resulted in the discovery of wasters from the kiln production as well as the foundations of several nearby dwellings. The nearly 20,000 recovered artifacts were washed and sorted by volunteers who came into the Dovetail lab in a steady stream. The work continues to this day with the help of volunteers to complete the final artifact preparation for curation/ labeling prior to the majority of the collection being curated with the City of Fredericksburg. The Marshall-Bell salvage project is a great example of how a community, non-profits, businesses, and professional and avocational archaeologists can work together on a site to produce a final product that can benefit not only the archaeological community but the region as well. Without the help and cooperation of the various private, local, regional, and state stakeholders this project would not be possible, and Dovetail is eternally grateful for everyone’s help and continued interest in the site. In March 2015 Dovetail will be honored with HFFI’s Executive Director’s Special Recognition Award for their generous support of archaeological research at the Marshall-Bell Kiln site. While Dovetail is greatly appreciative with this recognition, the work was truly a cumulative effort and could not have been completed without the help of all those involved. We hope in the months to come that we can put our plan into action and get the Marshall-Bell type collections in the hands of those interested. Maybe one day future researchers will be able to identify complete forms of the pottery made at the Marshall-Bell kiln site.